Have you ever gotten into an argument with a loved one and gotten so angry you didn’t really hear a word they said? I think we have all been there and it never feels good. While it’s impossible to avoid all conflict, we can actively take steps to repair and learn how to process our feelings in a way that helps us learn from the experience. Research shows that avoiding conflict is more damaging to relationships than facing it head on. The key is learning to communicate through conflict and learn from the experiences. Dr. John Gottman, a leading researcher in the field of marriage and family therapy, developed several tactics for processing conflict to produce greater understanding and ultimately greater growth and connection. First, take some time to calm down. It’s common to want to get stuck in trying to argue the “facts,” decide who’s right and who’s wrong and to explain why we are right and all the reasons our partner is wrong. Each person’s reality is valid, each perception is valid. Be sure to focus on understanding your partner’s perspective. Identify and share your feelings. You don’t have to explain or say why you felt that way. Don’t talk about your partner’s feelings, don’t assume or try to guess how they are feeling. Remember, share only how you felt about the experience without justifying or explaining your feelings. Try to leave opinions out of it but tell them what happened from your perspective as if you are telling a story. Talk only about how you felt, not what you think your partner was feeling or make assumptions about their intentions. Avoid attack and blame. You can say, “I heard you say,” instead of “You said,” this gives your partner an opportunity to correct any misunderstandings. Take turns doing this. Summarize what your partner said and validate at least one part of their perspective, – you might say “It makes sense to me how you saw it this way and how that could upset you.” This doesn’t mean that you have to agree with their reality, it simply means you can understand part of your partner’s experience. Check in to make sure you both feel heard and understood. If not, ask “What do I need to know to understand your experience better?” Try summarizing again and asking if you got it that time and ask if there is anything else they want you to know about their experience. What are some of the experiences or memories you had that might make the problem more difficult? Share the story of why these are triggers for you, this will help your partner to understand you. What part of the interaction triggered a big reaction for you? Some examples might be that you felt excluded, judged, criticized or ashamed. Take responsibility for your role in contributing to the problem. Perhaps you regret that you were defensive, negative, critical, unreasonable or disrespectful. Own what you can and apologize for your part. Some examples might be that you’ve been feeling more stressed lately or maybe you have not shared much with your partner lately. Maybe you didn’t take the time to ask for what you needed or perhaps you’ve been preoccupied and haven’t been a very good listener lately. Discuss one thing your partner can do differently to make the discussion of this issue better next time. Then identify one way that each of you can do something differently than you did this time. Take the time to talk about what you need to do to put this behind you and move forward. Try to be as agreeable as possible to the suggestions made by your partner. Everyone experiences conflict in their relationships but it doesn’t have to be a negative experience. Using effective communication, patience and empathy you can learn manage conflict and even use the experience to grow closer to your partner. 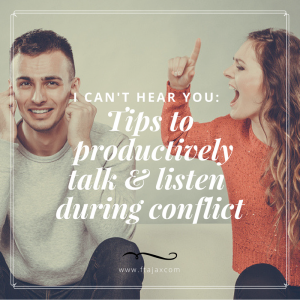 Surprisingly, there are a lot of benefits to conflict – it is an opportunity to learn about your partner, find out what they want and need and how they experience different situations. If you find yourself feeling defeated by conflict or stuck in the same cycle of conflict, we can help you improve your communication and conflict resolutions skills.